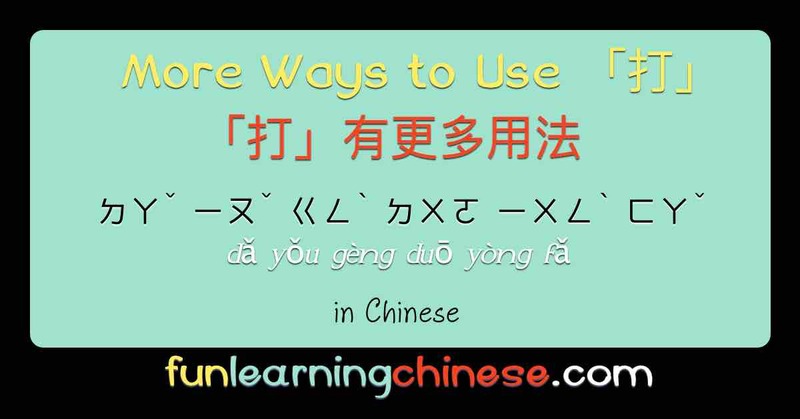 Recently, my tutor went over many ways to use 打 ㄉㄚˇ (dǎ). We also discussed the parts of the character 打 and how they relate to its meaning. Then, for the next lesson I had she had quite a few more ways she wanted to list. Many of them are quite fun. I want to dress up a bit. Wow! You dressed up just like Santa Claus! I really want to learn how to knit. Sometimes my husband snores very loudly! After I drink soda, I usually burp quite a few times. After a baby is nursed it will burp. When you are very tired, you will almost certainly yawn. I guarantee he will laugh! I guarantee you, it will surely rain tomorrow. Whenever I eat popcorn, I usually get the hiccups for a few minutes. I don’t know why I can’t stop hiccuping today! I forgot to wear my coat; I’m so cold I’m shivering. I don’t know why this call isn’t going through. When I’ve already arranged my schedule, he messes it up. His wife takes care of nearly all the household affairs. When you are driving a car and turn a corner, it is important that you signal. When you see your little sister, tell her hello for me. How long do you plan to be a bachelor? He is always the first to take action, because he is the most courageous. He always cracks a joke when you talk to him. When she learns a song, she will use her foot to beat the time. There is almost always a sale. Every time I go shopping I hope to find things that have been discounted. There are many more uses of 打 in my little green Chinese- English dictionary. I think I will understand them all better now. And using them will be more fun. ❷ 毛線 ㄇㄠˊ ㄒㄧㄢˋ literally translated mean “fur/hair/feather thread.” Much more exact than “yarn.” There are other first characters used for yarn or thread depending on the exact material spun to make it. ❸ When I first tried to write this sentence, I was thinking of how we use “discount” as a noun in English, such as “That was a good discount.” However, it is only verb in Chinese.